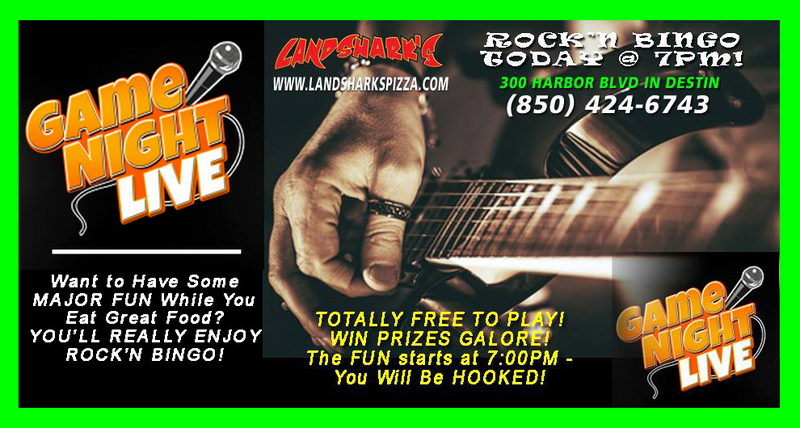 / Best Taco in Destin FL / Enjoy TACO TUESDAY Award-Winning Budget-Friendly Tacos & ROCK’N BINGO|$4 MARGARITAS & $2.50 CORONAS! 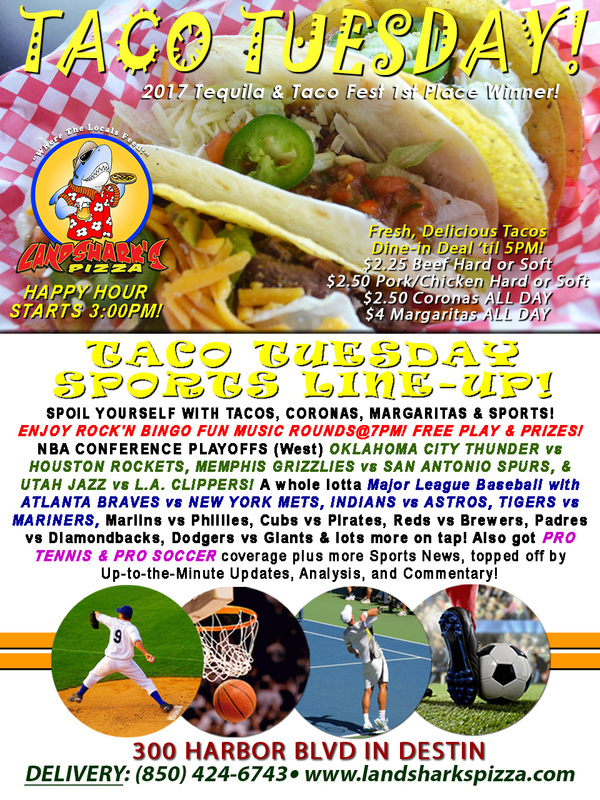 Enjoy TACO TUESDAY Award-Winning Budget-Friendly Tacos & ROCK’N BINGO|$4 MARGARITAS & $2.50 CORONAS! Feast on the taco that took the 1ST PLACE WIN at the 2017 Destin Florida Taco & Tequila Fest! Our TACO TUESDAY SPECIALS: $2.25 BEEF, $2.50 PORK OR CHICKEN (dine-in ’til 5pm with regular drink purchase). Also featuring $2.50 Coronas & $4 House Margaritas go all day long! The GOOD TIMES CRANK UP@7PM with ROCK’N BINGO! HOT SPORTS ON OUR ARMY OF BIG SCREENS – NBA CONFERENCE PLAYOFFS (West) OKLAHOMA CITY THUNDER vs HOUSTON ROCKETS, MEMPHIS GRIZZLIES vs SAN ANTONIO SPURS, & UTAH JAZZ vs L.A. CLIPPERS! 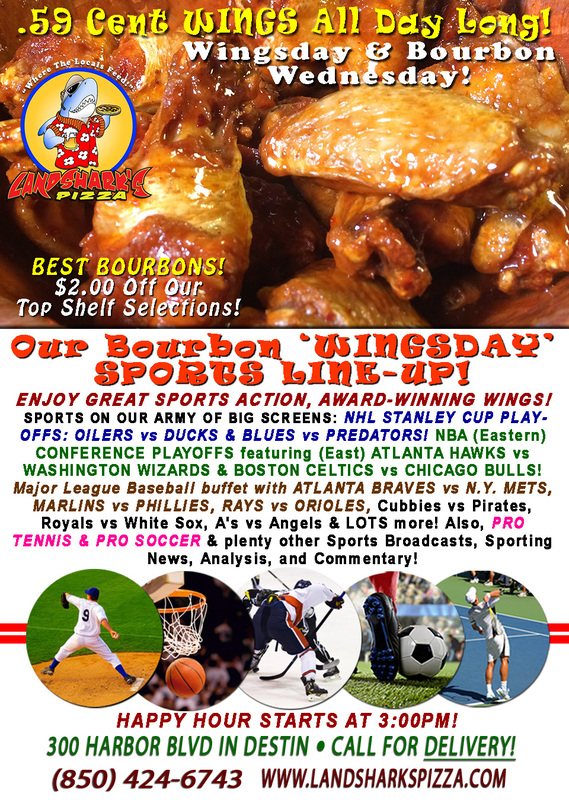 A whole lotta Major League Baseball with ATLANTA BRAVES vs NEW YORK METS, INDIANS vs ASTROS, TIGERS vs MARINERS, Marlins vs Phillies, Cubs vs Pirates, Reds vs Brewers, Padres vs Diamondbacks, Dodgers vs Giants & lots more on tap! Also, PRO TENNIS, PRO SOCCER & plenty other Sports Broadcasts, Updates, Analysis, and Commentary! NASCAR This Week: XFINITY Toyota Care 250 (Sat. Apr 29th)|MONSTER ENERGY Toyota Owners 400 (Sun. Apr 30th) from Richmond International Raceway. 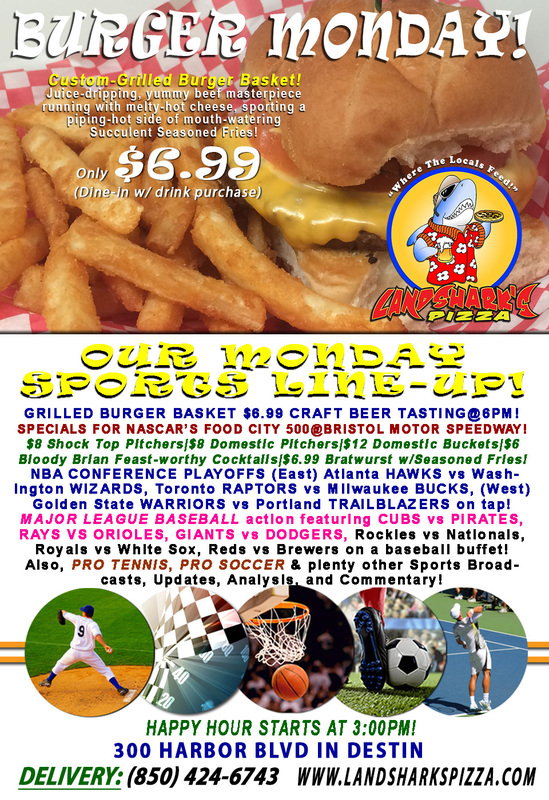 Previous Post: « FOOD CITY 500, NBA Playoffs, CRAFT BEER TASTING & $6.99 Burger Basket & on BURGER & CRAFT BEER MONDAY!